With the dearth of good natural climbing in the immediate Seattle metro area (except for that mythical sweet Renton granite), it’s either climbing gyms or UW Rock when the weather permits to get your climbing fix on. Seattle has a couple of pretty good gyms (along with the legendary REI massif), and soon will have one more: The Seattle Bouldering Project. You might notice a their logo/ad in the sidebar, they are supporters of Cascadeclimbers.com. 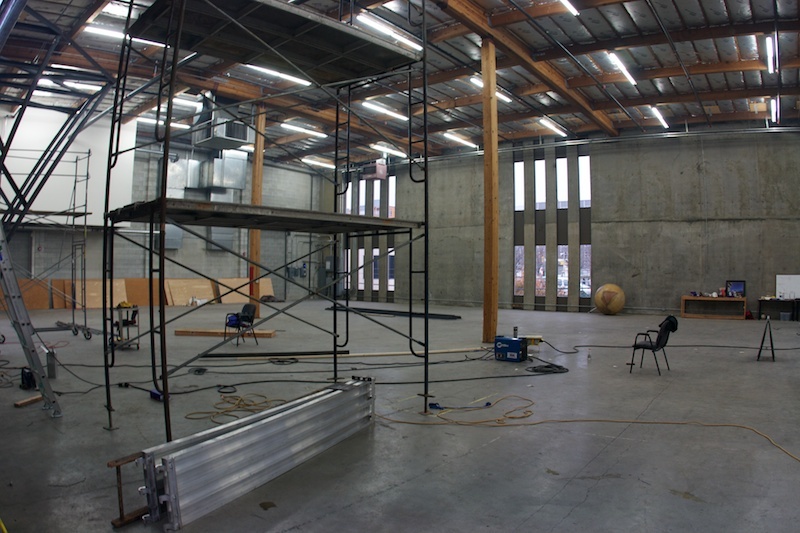 I have heard talk of what the Seattle Bouldering Project is all about, and when Chris Potts and Andy Wyatt (the owner/managers of the SBP) invited me to check it out the space, curiosity got the best of me. Being from West Seattle, I’m definitely interested in a gym that isn’t in the Ballard area. If it is a 10-minute drive from my house, I’m even more interested. Ulee and I went down to check it out. 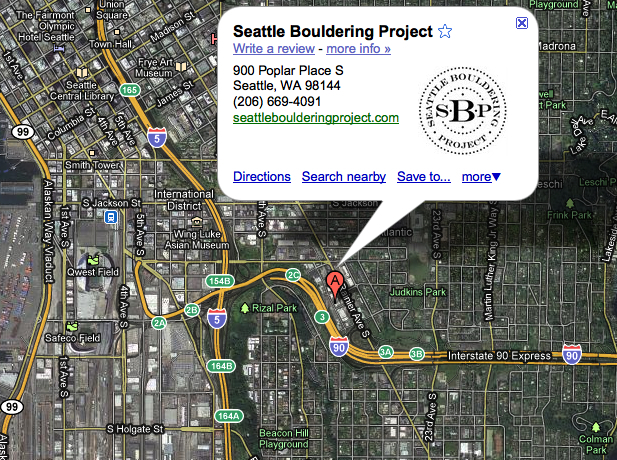 Click here for a map to the SBP. As you can see, it doesn’t get much more “centrally located” than this for Seattle, so climbers from much of the rest of Seattle should be pumped about having a closer option over the Ballard area gyms. The space is all I had heard: huge. 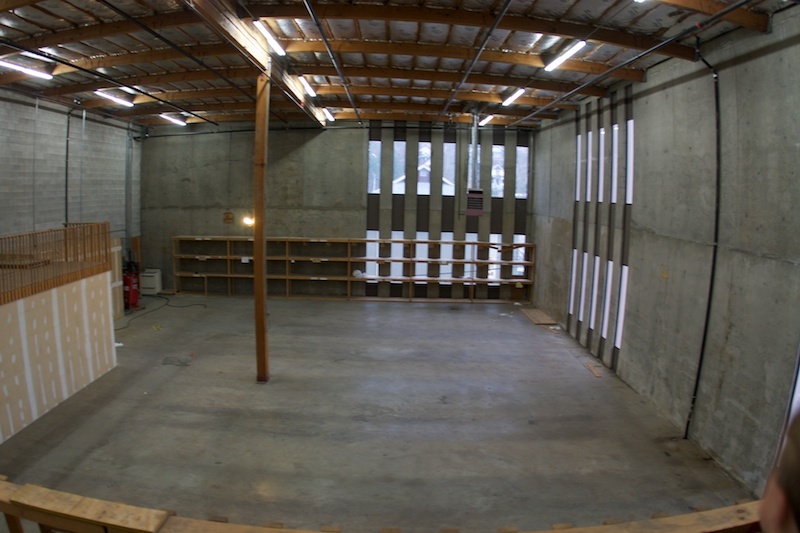 It is a big space, and it will soon be filled with things for you to climb all over. 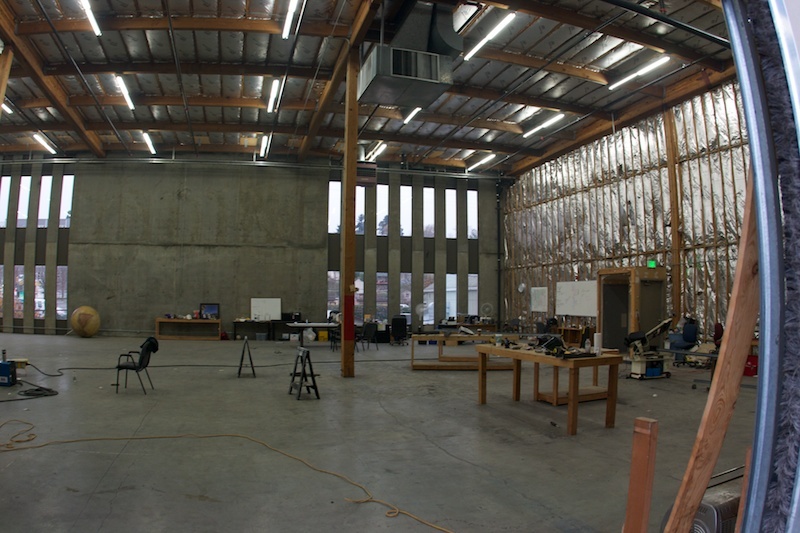 The layout is one huge room/space and a second slightly smaller space. A wall currently separates these spacers, but the plans are to unite them by cutting a large hole in the wall that separates them so you can literally climb from one room into the next. 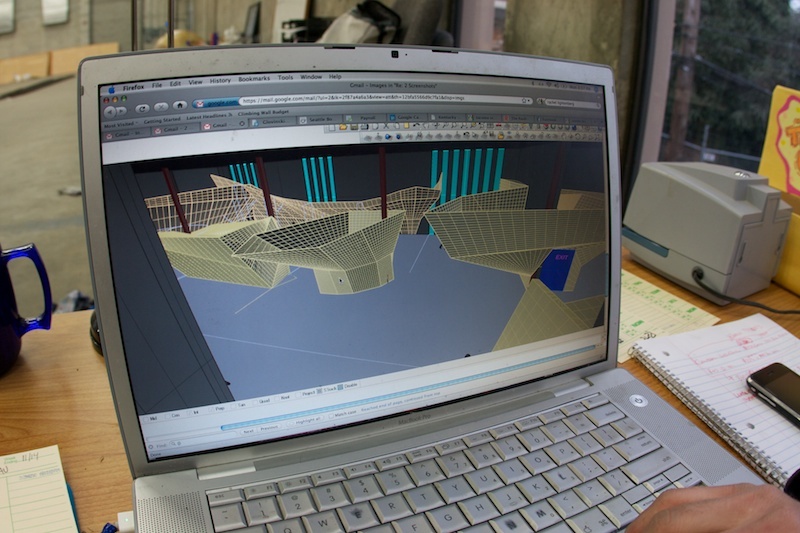 While this will be a “bouldering only” gym (no ropes), it is sure to be designed with alpine climbing in mind as both of Andy and Chris are alpine climbers. 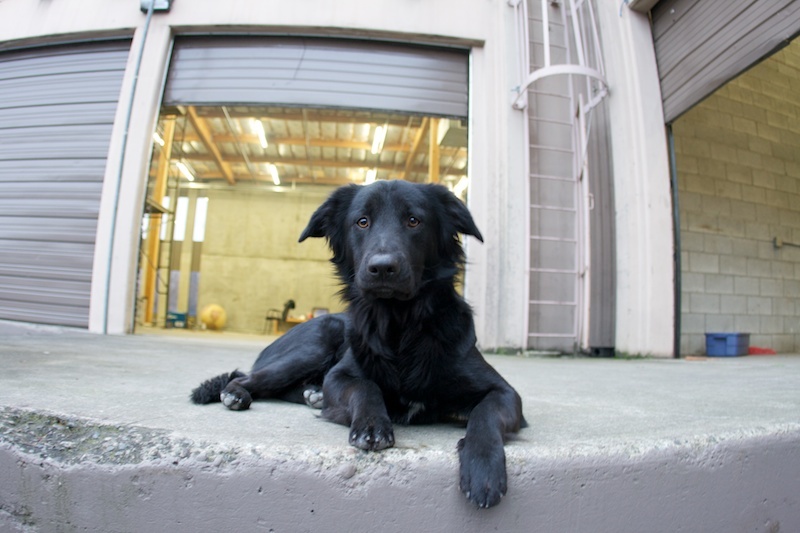 Additionally, a key member of the design team for the gym is Dylan Johnson, a well-known PNW alpine climber. Also key in the construction are Mike Shau and Peter Rehrmann who are doing the welding for the climbing structures (you can see the first one going up here). The first feature going up. The space is really unlike any other climbing gyms I’ve been to. It is really a large, open space. One of the ideas that Chris said they had in mind in designing it, was to maintain an feeling similar to the Sentinel Boulders at Yosemite. You wander around in big room filled with climbable features. 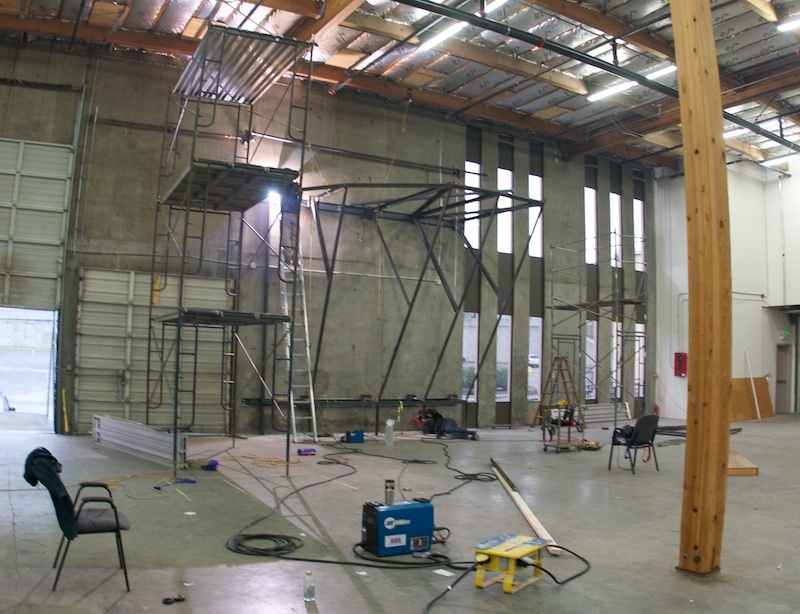 The space will be designed to have more challenging climbing as you move north in the building. The southern most climbing area will be designed for kids, and routes will grow more challenging as you move north. There isn’t a set time for opening, and our visit was evidence that there is plenty of work is ahead for the SBP crew. The phone was ringing; Chris had to break away to coordinate the welding effort of the gym’s first climbing feature, not to mention the group of people being shown through the place in front of us. The Seattle Bouldering Project is doing a lot to reach out to the community as well, even before they open. They are working with YMCA BOLD, Passages NW, The POST, and a couple of other non-profit outdoor education groups. As a West Seattlite, I couldn’t be more happy about having a closer option get a good climbing workout, especially during the long wet and cold season we put up with to live in this fine city of ours. I’m genuinely psyched about what Chris and Andy are doing with the Seattle Bouldering Project, I personally would love to see this thing succeed. If you’re interested in checking out the space, while SBP is very busy, Chris and company are interested in taking a little time to show interested parties around the space. Additionally there will be a “pre-opening warehouse party” in the coming weeks, so look out for that. For information about this party and ongoing progress of the construction (including when they will open) you can check out their Facebook page [http://www.facebook.com//SeattleBoulderingProject] or their website [http://www.seattleboulderingproject.com/].